Apple and its fledgling iAds mobile advertising service are the target of a new lawsuit from a company that owns a patent related to location-based ads. Apple was named along with a host of other wireless advertising companies in the lawsuit from StreetSpace, including Quattro Wireless, which was purchased by Apple earlier this year and is now being phased out in favor of iAds. Other defendants include Google, AdMob, Nokia, Navteq, Millenial Media and Jumptap. StreetSpace is headquartered in Malaysia, and the company is the creator of a remote Internet terminal known as the Web Station. Users can walk up to one of these terminals to access the Internet, and are delivered targeted advertisements in the process. Related to that invention is U.S. Patent No. 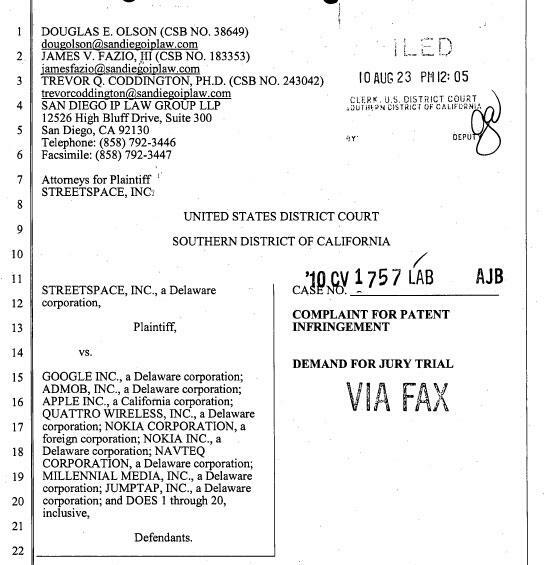 6,847,969, which StreetSpace has alleged Apple and others are in violation of. Named "Method and System for Providing Personalized Online Services and Advertisements in Public Spaces," it was granted on Jan. 25, 2005. The lawsuit notes that StreetSpace's mobile terminal products were available in the late '90s at bookstores, retail stores, cafes and restaurants in Berkley Calif., and had more than 30,000 registered users. The "Street Line" terminal, as it was then known, was also used during in the Olympic Village at Salt Lake City, Utah, during the 2002 Winter Olympics. Now known as the Web station, the product is said to be used by a number of leading banks in Malaysia, including Maybank, CIMB Bank and AFFIN Bank. The suit alleges that Apple's iAds service, launched in iPhone applications on July 1, is in violation of its patent because it delivers personalized advertisements based on a user's location, profile and usage history. The delivery of ads on the iPhone, iPod touch and (eventually) the iPad is infringing on the '969 patent owned by StreetSpace, the company claims. The complaint was filed last week in a U.S. District Court in the Southern District of California.